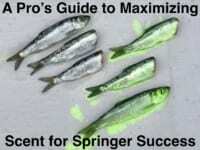 I’ve been getting flooded with questions recently on how to cure loose single eggs for Great Lakes trout and steelhead. These are eggs that we use in eggs sacks, exclusively, not those that we’re going to place on a hook. If I want to use an egg on the hook I’ll use jarred eggs. Curing single eggs is an easy, quick process that produces great bait for salmon, steelhead and brown trout in all lake tributaries. And, it’s easier than you might think. 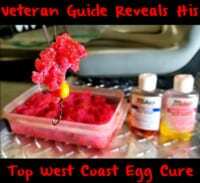 This cure works for me on salmon, trout and steelhead eggs. It will work on any egg and doesn’t require a ton of time. The total process from getting the eggs from the fish to tying them in an egg sack is six hours. To have a good cured egg you have to have a good raw egg. You have to water harden them. To explain this further: this means when you milk the fish the eggs that come out are soft. If you throw those eggs in the cure they don’t always come out right. They’ll be soft, deflated or deformed, and don’t always take the cure. This is why water hardening is important. To properly do this you are going to rinse your fresh eggs as soon as possible. Blood is the enemy. That ruins the eggs. You want to rinse the eggs thoroughly in spring or creek water (non chlorinated water) and make sure the blood is gone. After rinsing place the eggs in a bucket or container (with trout eggs you only get a cup or two, but with salmon eggs you could fill a bucket) and cover the eggs with chilled spring water. Let the eggs soak for three hours. This will cause the eggs to harden and also make your eggs swell. After doing this you should have a round, firm, clear egg. This is prepping or maturing the membrane. Drain off the water (some of us use a strainer) before adding Fire Brine. Now simply pour enough Fire Brine to cover the eggs. Make sure the eggs are in a container because the Fire Brine will cause them to swell, which is good. These eggs will absorb the Fire Brine. Let the eggs soak in the brine until you are ready to fish them. Personally, I don’t remove the eggs from the brine until I’m ready to tie them in sacks. The brine preserves and protects the eggs and enables me to store them in the fridge or the freezer. I’ve kept them in the fridge for six to eight months and in the freeze for more than a year and they’ve remained in good shape. You can freeze them and thaw them later if you want. 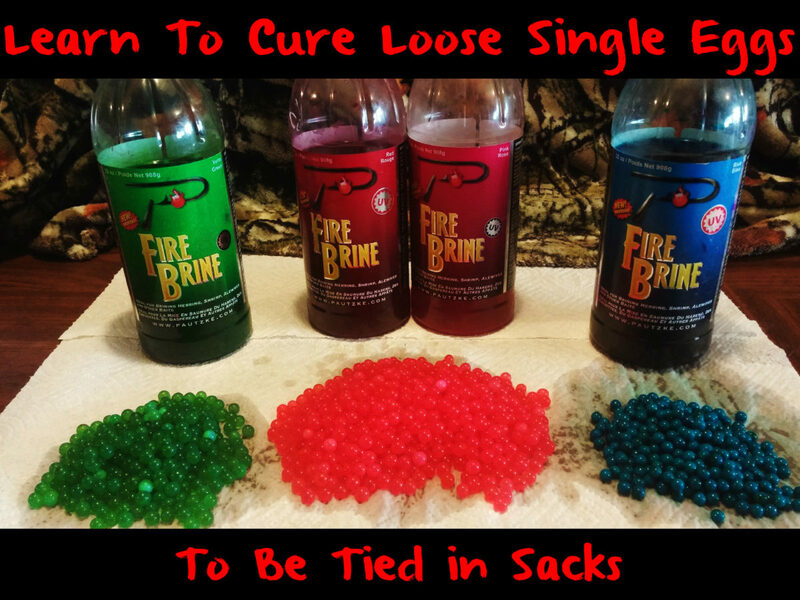 You can cure eggs to whatever color you want with the Fire Brine. You can customize colors or use something standard like red, orange, natural or pink, which most trout and steelhead guys use. Surprising to many, two of my favorite colors in the Great Lakes is Chartreuse and Blue Fire Brine. The trout go crazy when they see the blue eggs. While many anglers are intimidated by curing singles if you try this technique it will be evident that the process is fool proof. It’s that simple: pour the Fire Brine on the eggs, let it sit and the brine will do all the work. The brine is pre-mixed cure so you don’t need to do anything other than pour the solution on the eggs.